The 2016 Ironman St George 70.3 was one of the hardest half-Ironman races I've ever done! With steep hills on the bike and run, the course itself is harder than most 70.3's but what made this one even harder (almost unbearable) was the COLD RAIN that fell on us during the bike portion of the event. Ugh! Pre-Race - My friends, Jade, Jim, and Joe, all part of the Greeley Triathlon Club, traveled to St George, Utah, with me to do the race (from Greeley, CO). All three of these guys are experienced triathletes with 15+ full Ironman races between all of us. We picked up our packets Thursday night after the long 11-hour drive from Greeley. It was very warm when we got there; someone said it was 91 degrees and sure it felt like it. On Friday, we took our run and bike bags to T1 and T2. I asked the guys if they were going to put a jacket in their bike bag and Jim and Joe said no, it will be pretty warm during the race and we won't need one. After all, the forecast called for only a 20% chance of rain on race day and a high of 70. However, Jade said he was going to throw one in his bag along with his long-sleeved jersey. The photos from last year's race popped into my head: sunny blue skies and sweaty athletes wearing tri-kits and looking very hot. Still, I threw my yellow bike jacket in my bike bag anyway. If I didn't need it, no problem!. What about bike gloves? Nah, won't need them. Toe warmers? Nope, won't need those either. We decided to make dinner at the house we were renting and went shopping for food. One of the cardinal rules of race nutrition is to keep your pre-race food simple and familiar to you. So, pasta with chicken and french bread was our meal of choice. Simple, cheap, and high in carbs. Perfecto! I threw in a Stella Artois before dinner too (yes, I drink beer before a race). Here we are enjoying our yummy pre-race meal. Off to bed by 9:00 PM and up at 3:30 AM to get to the shuttle by 4:45 AM. I knew I needed to top off my glycogen stores so I grabbed a good-sized handful of dark-chocolate flavored roasted almonds and about 6 or 7 dates (love that combination!). I also had a banana, small glass of orange juice, 8 oz of Chobani Cherry Greek Yogurt and a cup of black coffee. Since my wave wouldn't be starting until 7:40, which was 3 hours away, I took along Gatorade, dates, almonds, and a powerbar, all of which I consumed before the race. We arrived at the race site in plenty of time to check our bikes and get ready for the swim. It was dark and cold, probably in the upper 40's. As the sun came up we could see the sky was covered in clouds with dark, stormy clouds to the west. "I don't like the looks of those clouds" I said to a woman next to me in the transition area. She looked at me in a funny way and I felt a bit embarrassed at first but a 2nd look at those clouds confirmed my fearful feelings. Oh well, what can you do at this point? 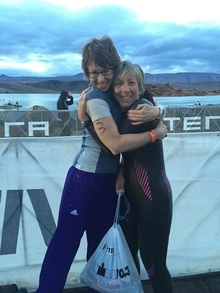 I put on my wetsuit and went to look for my friend, Julie Hansen, MS RD, who I've been friends with for 20-some years. She is a sports dietitian like me and lives in Ogden, Utah. She and two friends were doing the race as a relay. I hadn't seen Julie in a few years so I was excited to see her. The Swim - Water temp was 64 degrees, which is not too bad. I've swam in much colder! This would be my first open water swim for the year since I hadn't had a chance to get in the water before race day. I wasn't too worried about it - I've done enough open water swims to know what to expect. The swim went relatively well but was more crowded than expected. I couldn't get into a rhythm until almost the 3rd buoy because there were so many people. But it didn't bother me too much. I've been jostled around in a lot of races and I knew the best thing to do is stay calm and keep swimming. On the last stretch there were some big waves and I got a mouthful of water several times. Other than that, it went well. My time was slower than usual (42-something) but not too bad. The Bike - And the fun begins! When I took off my wetsuit I was freezing so I grabbed my bike jacket just as it started raining. Thank God I put that jacket in my bike bag! It started to rain and I hate riding in cold rain! I was really regretting not bringing any gloves (and for signing up for this race!).. Brrrrr!! The first six miles of the bike course were heavily chip-sealed and the rain was really coming down, making it a very hard ride. I looked up to see if there was any clearing of the clouds but there was none. In fact, there were dark heavy clouds in the direction of Snow Canyon. Great. Heading out on the bike IN THE RAIN! Elevation gain chart for the bike course - see what I mean about hills?? It rained for the first half of the ride and then stopped for a few miles, then started again, then stopped, and then as we turned into Snow Canyon, it started again (of course) and then came the headwind. Lovely. I kept thinking that I could stop and put an end to my misery but I was feeling good physically and honestly, I needed to keep moving to stay warm. We were getting into the hard stuff now and I wanted to climb this hill. So up we went...and up, up, up. It wasn't as steep as some of the hills I have trained on but it was long and when you're cold and wet, it seemed even longer. My legs were burning by the time I got to the top and all I could think about were my hands and how cold and stiff they were. This made shifting hard because I couldn't seem to grip the gear shifters well enough to shift when I needed to and that wasn't good! I was also thinking about how hard the run was going to be and that I might not even be able to do the run. I decided that I would walk the half-marathon if I had to (which wasn't a pleasant idea considering I was soaked and would likely freeze while walking). But I was determined to finish this darn race no matter what so I just pedaled on. I knew I would need some energy on the run and since it had been several hours since I ate last, I managed to eat a Cliff Bar as I rode in the rain. I took a big gulp of sport drink from my bottle and pedaled on. Coming down the last hill out of Snow Canyon in the rain was scary! The rain kept covering my sunglasses making it hard to see and with stiff hands, I couldn't grasp my handle-bars very well. Not a good combination when you're going fast down hill! Finally made it to T2 and the rain had stopped - yay! Time to get off this bike - yay! The Run - This is where the miracle happened. I got off the bike, grabbed a few gel blocks and a swig of water, hit the porta-potty, and started running. My legs felt fresh and ready to go. I had lots of energy and just wanted to run - wait, didn't I just ride 56 hilly miles? Didn't I just tell myself that I would probably have to walk 13.1 miles?? I ran slowly up the first hill, passing several people who were walking. So far, so good. Maybe I can run the first few miles but surely I'll have to stop and walk soon. Then I ran up the second hill,, and the third, and the fourth, never breaking my stride. What is going on?? I have never felt this good in the run part of a half-Ironman before! Nutrition-wise, I grabbed a cup of Gatorade every other mile and a few gel blocks and banana halves. I took water at alternating miles but ran through all the aid stations. I decided at mile 9 that if I could keep going without stopping this far, then I could make it to the finish without stopping. Then, at mile 10, I came up behind Joe (who was walking) and he started running with me, which was great. We picked up the pace as we started the long descent to the finish line. I felt like I was on auto-pilot and literally could not stop if I wanted to. What an amazing feeling! We cruised the last few miles and I ended up with a run time not that much slower than what I run a regular half-marathon in (2:23). Overall finish time: 7:15 - considering the difficulty of the bike part, I'll take it! I got 14th out of 31 in my age group (55 - 59) which isn't bad considering I wasn't even trying to place in my age group. Nutrition played a big role in how I did because I felt so energetic most of the way. The key is to eat well the days prior to your race, the morning of your race, and during the race. What works for one person might not work for others but a higher carb, moderate fat diet seems to work for me. Now, onto the 2nd 70.3 race! !